Where globalization and CNC meet art nouveau. THE SUREST WAY TO BE OUT OF FASHION TOMMORROW is to be at the height of fashion today. That was the gospel of good taste according to 19th-century English arbiter of style, Beau Brummell, and over the intervening 200 years or so, he has been proved right again and again. Brummell’s rule applies to rifles, just as it does to dinner jackets. For the first third of its life—roughly 1936 to 1963—the Winchester Model 70 established the style and taste that other rifles tried to emulate. Although not perfect mechanically or aesthetically, the early Model 70s were better than anything else available, and they set the tone for all American bolt-action hunting rifles. The old Model 70 achieved something beyond the realm of mere utility: Using it became a pleasure in itself. It’s not precisely known who gave the Model 70 the nickname “the Rifleman’s Rifle,” but the compliment stuck, and for good reason. A rifleman is someone who both knows about rifles and appreciates them in all their aspects. The Model 70 was not dubbed the Hunter’s Rifle, although hunting was its primary purpose, or the Marksman’s Rifle, although it won its share of medals over the years. What the Model 70 gave a rifleman was a combination of the finest steel available, nice walnut, good workmanship, a design that left very little to be desired, and finishing that denoted pride at every level in the factory— all wrapped up in a package that was a pleasure to use from a purely ergonomic point of view (although that odd word had yet to be coined). The old Model 70 achieved something beyond the realm of mere utility: Using it became a pleasure in itself. That is a quality found in other famous products, from BMWs to Rolexes, and according to reports, such ultra-responsive mechanisms as Britain’s Supermarine Spitfire in the Second World War. With some instruments, the tool becomes an extension of the user’s body; in others, the user becomes an integral part of the tool. With a rifle, that quality allows fast and accurate shooting, reacting effectively to sudden circumstances, and operation at all levels without conscious thought. Because the rifle is such a pleasure to use, you use it that much better. If that’s too esoteric, imagine a Cape buffalo bursting out of the bushes, or a snap shot at a disappearing whitetail. 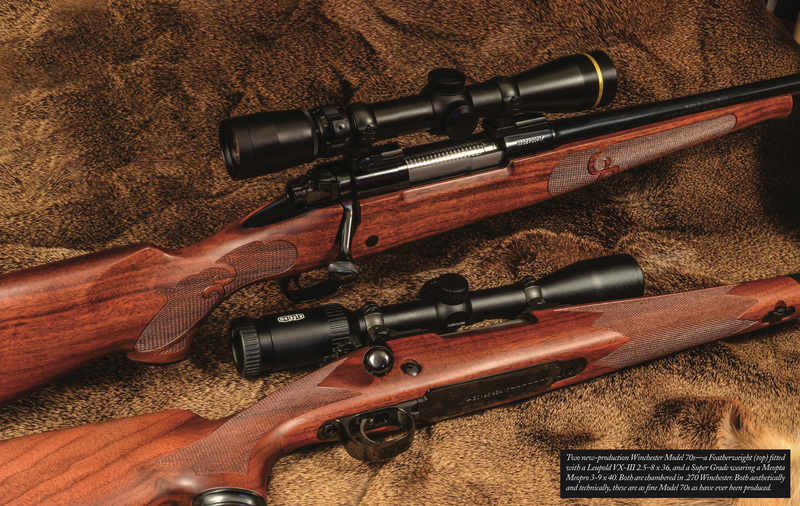 The importance of ergonomics in rifles—and by extension, aesthetics—can hardly be overstated. Aesthetics is connected to ergonomics through the rule of design that form must follow function, and graceful appearance becomes the visual actualization of ease of use. Winchester’s employees in the 1930s probably didn’t think in those terms, but they were all heirs to the principle of the earlier art nouveau movement, in which craftsmen sought to create “usable art” even in everyday objects. This was not art for art’s sake; rather, it was art in the furtherance of utility. For a variety of reasons, including the aftereffects of the war, such artistic principles came into question in the 1950s. In some cases, they were deliberately discarded in favor of ugly utilitarianism, while in others they were replaced by an infatuation with skin-deep decoration. By 1962, Winchester’s production machinery for the Model 70 was fast wearing out, and decisions had to be made. Retooling is an expensive proposition, and it did not make sense to spend that money to continue with a frankly aging product, especially since the Rifleman’s Rifle was under assault from competitors both technically and stylistically. The new Remington Model 700 was claiming greater strength, superior accuracy, and a hot new cartridge—the 7 mm Remington Magnum. From the West Coast, Roy Weatherby was not only offering velocity and power with his line of cartridges, but he also had a strong “modern” action (the Mark V) done up in trendy “California” style. This, you may recall, was right around the time the 1959 Cadillac set a standard for tastelessness with tailfins that defied belief (and resist recollection), inspiring other cars to measure up (or down) to their level. In such a world, the Weatherby Mark V was almost conservative, and truth to tell, it has stood the test of time where tailfins have not. Personally, I like the Weatherby style because it is, contrary to most reports, eminently usable. Looks aside, it has all the ergonomic qualities desired, but accomplished in a different way. What I dislike are Weatherby imitators that either go too far (Winslow, et al) or timidly not far enough (almost everyone else), and give you the worst of both worlds.